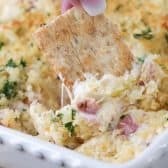 A cheesy creamy dip with all of the flavors of your favorite Reuben Sandwich. Beat cream cheese, sour cream and dressing with a mixer on medium until fluffy. Add remaining ingredients and gently stir until combined. Spread into a 2qt baking dish. Combine topping ingredients in a small bowl. Sprinkle over the dip. Bake 18-22 minutes, or until hot and breadcrumbs are golden brown.